Electric skillet is a perfect option for people wanting extra cooktops in their kitchens. 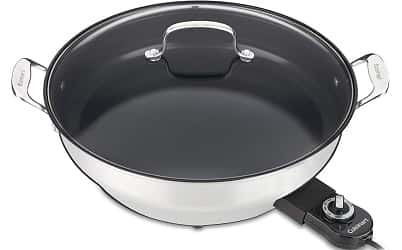 Electric skillets are suitable for pan frying, deep frying, sautéing and even steaming or grilling dishes. Electric skillets provide even heating and maintain a consistent temperature. They have become popular in the modern times especially among people living in small flats and houses with limited kitchen spaces. 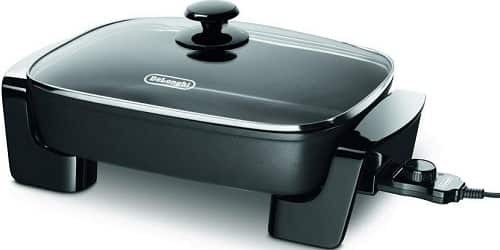 Electric skillets can also be used to cook dishes in hotel rooms with no kitchen space. They also come in handy for cooking side dishes during dinner parties and other events when the conventional stove space is occupied by other dishes. Keeping the food warm is another useful function of electric skillets. There is no dearth of option when it comes to electric skillets in the market. They are available in a plethora of sizes, models and brands with different features. One needs to purchase an electric skillet according to their needs and budgets. Size and performance are the two major features that people commonly consider when purchasing electric skillets. The best electric skillets can cook a variety of dishes, provide even heat distribution and can be cleaned easily. These are some of the best electric skillets rated highly by the users and occupying prominent positions in terms of sales and ratings. People also looks for the Best Cast Iron Skillet for their kitchen take a look. This is an electric skillet manufactured by Presto which is made of heavy cast aluminum. Both the inner and outer surface of the appliance is non stick in nature. Other features of the product are as follows. 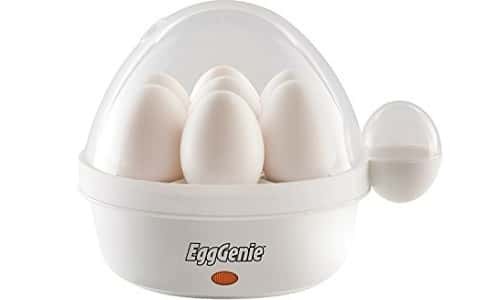 Provides stick free cooking experience and is easy to clean. The cooking temperature achieved by the electric skillet can be as high as 400 degrees Fahrenheit. The master heat control maintains the correct cooking temperature automatically. The base size is 16 inches. The sidewalls are also high which provides more space for cooking. The pan has an in-built spout which acts as a spoon rest and also serves many functions such as venting and pouring. The lid is made of tempered glass which enables you to see the food inside making this skillet a good choice for buffets. Safe to be washed using dishwasher. The heat control needs to be removed before washing. One year limited warranty is provided by Presto. De Longhi is a popular brand of cooking appliances used in kitchens. BG45 Electric Skillet by the company is one of the top products of the company due to the following reasons. The pan is made of die cast aluminum which is covered with a layer of Teflon. Die cast aluminum conducts heat very well while the Teflon coating provides a non stick surface for cooking. Even heat distribution and highly efficient cooking is made possible by the embedded heat element used in the skillet. Heat can be adjusted using the thermostat. The skillet can reach 400 degrees Fahrenheit cooking temperature. The input power is 1500 Watts. Steam evaporation takes place through adjustable steam vent holes. The cool touch handles makes it safe to handle during and after cooking. Cuisinart is one of the top manufacturers of kitchen appliances. The CSK-250WS GreenGourmet 14-Inch Nonstick Electric Skillet is one of the top selling electric skillets by virtue of the following features. The 14 by 14 inch cooking surface is made of ceramic. The ceramic cooking surface is non stick in nature, petroleum-free and also does not contain PTFE or PFOA. The exterior has been constructed of die-cast stainless steel. The handles are also made of die cast stainless steel. The power rating of this skillet is 1800 Watts. The heat is adjustable and the temperature can go up to 450 degrees. This skillet can fry, simmer, braise, sear or griddle easily even without butter or oil. The lid is made of tempered glass which enables you watch the food cooking without the problem heat escape. It is safe to be washed using dishwasher with the heat probe removed. The product is accompanied by a recipe booklet containing more than 20 recipes. 3 year warranty is provided by the manufacturer. 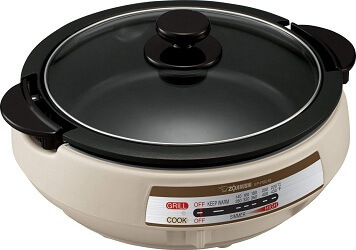 This electric skillet by Oster is ideal for cooking a plethora of dishes. The major characteristics of the skillet are as follows. The cooking surface is large at 12 by 16 inches. Cooking is 30% faster and the non stick cooking surface lasts 8 times longer than other non stick cooking surfaces due to titanium-infused DuraCeramic coating. Temperature knob enables easy temperature settings and adjustments. The handles remain cool to touch which enables buffet serving. The tempered glass lid also has steam vents which do not allow moisture to accumulate on the glass lid. The electric skillet comes in black and silver varieties. This electric skillet by Zojirushi is a versatile skillet which features two pans. The main features have been listed here. The flat plate has a ceramic surface which has a nonstick coating enhanced by titanium. This surface is ideal for frying and grilling eggs, bacon, seafood, steak, etc. The deep dish inner pan is ideal for cooking soups, hot pots, braised roasts, etc. The temperature settings are adjustable with a minimum of 176 degrees Fahrenheit and a maximum of 480 degrees Fahrenheit. Cool side handles which makes the removal of pan easy and safe. This is a large skillet suitable for a family consisting of four members. The superior features of the skillet which makes it popular are as follows. The body is made of polished 18/10 stainless steel. The non stick interior of the skillet makes for excellent cooking experience. The heat distribution in the skillet is even which helps in cooking swiftly. The temperature probe enables complete control over the cooking temperature and provides perfect cooking. The tempered glass lid does not allow heat to escape while providing a clear view of the cooking food. The skillet can be hand washed easily. ES-08 skillet by Nesco is suitable for people who live all by themselves or simply need to cook small meals. This is also a very affordable electric skillet. The chief characteristics are as follows. The interior of the skillet is deep which makes it ideal for roasting or frying. The interior is non stick in nature. The glass lid is strong and also has a safety vent. The handles remain cool to touch. The lid can be immersed in dishwasher. The main body of the skillet needs to be washed using soap water and dish cloth. This is a very beautifully designed electric skillet with a high customer rating on Amazon. The main features have been listed here. The skillet has a large cooking surface of 16 inches X 11 inches X 2 ¼ inches. This enables you to cook many foods at the same time. The exterior of the skillet is made of T304 stainless steel. The lid cover is also made of stainless steel to contain the heat within the skillet. The handles are insulated, non-slip feet and durable. This is yet another electric skillet which is highly rated by the customers. Have a look at the principal features of the skillet. The cooking surface of the pan has been coated twice with a premium grade non stick surface which is free of PFOA. Pan tilt lever is present on the skillet which helps in draining fat and juices from the food. The skillet features 15 heat settings right from simmer to high sear. This is yet another electric skillet which comes among the best sellers in the market. The essential features are as follows. The non stick cooking surface has a large dimension of 15” X 12” with high side walls. The base of the skillet has a heavy construction of cast aluminum. 450 degrees Fahrenheit temperature can be reached using the temperature controller. Temperature-ready light indicates the heating status of the skillet. Suitable for stir frying, frying, roasting and grilling. Power input of 1300 Watts. An electric skillet is a pan that operates without the use of the stove for cooking food. Since it runs on electricity, it can be plugged in and used as per convenience. ➢ Size – Since it comes in a variety of sizes, skillets can be used as per the amount of food required. ➢ Temperature Control – They have an additional option of controlling the heating temperature thereby making it ideal for frying food. ➢ Less energy usage – Since skillets run on electricity, they make minimal use of energy thereby conserving more. ➢ Aesthetics – Skillets are now available in a variety of colors, hence making it an ideal piece for your kitchen. ➢ Make sure that you choose the right size as per your requirement. Oversized skillets can take too much space in your kitchen. ➢ Temperature controls can lead to an increase in price. Hence, research a bit to find the right brand that gives all the features at an optimum rate. ➢ Due to the coating on the non-stick surface, metal spoons tend to get overheated. Hence it is ideal to select the one that has an excellent heating upon use. ➢ The right skillet should come with another layer that keeps the food warm. Make sure that the same is offered when you purchase your next electric skillet. Working off an Electric Skillet – The electric skillet works with the help of a heating element that resists the flow of electricity which in turn generates heat. This heat is then conducted upwards throughout the skillet. A thermostat prevents the overheating of the skillet thereby avoiding any damage or burning. ➢ To saute, grill or fry foods. ➢ Steam cooking without drying out. ➢ Cooking two dishes at a time. ➢ Make sure the skillet is cool before cleaning it. ➢ The inside of the skillet can be cleaned with soapy water. It is best to avoid the use of the dishwasher. ➢ The outside of the skillet can be cleaned with a damp cloth. Avoid use of any abrasive soap. ➢ Unplug the skillet before use to avoid the risk of any injury. ➢ Do not immerse any part of the skillet in water or any other liquid to prevent electric shock. ➢ Strictly follow the instructions as per the brand for safe and efficient use. ➢ Make sure that the thermostat is attached to the electric skillet before starting its use. The same should be removed after usage. ➢ In case the skillet contains food, and it needs to be moved, follow utter precaution while doing the same. ➢ To avoid disbalance, make sure that the skillet is kept on a flat surface. ➢ Do not keep the skillet near a hot oven or stove. ➢ Make sure that the electric skillet and its attachments such as the cord are in good condition before using. There should be no damage, especially in the wire. ➢ Strict supervision is required when children are allowed near the skillet while in use. They should not be allowed to play with the appliance. ➢ Make sure you use a wooden handle and pre-heat the skillet before adding oil or fat. ➢ Surgical Stainless- prevents metals from leaching into the food. Skillet was highly in use in the earlier days. However, with the passing generations, the demand has subsequently reduced. Skillets with a shorter cord length and more no of coils, prove to be the most effective ones. Hence it’s high time that these useful appliances should be brought back to business. The electric skillets listed above certainly narrows down the choices according to customer reviews and ratings. However, you should be clear about your preferences and requirements when purchasing an electric skillet.